Westside detached house active listings this May are up 4% from April (850 from 817) and are up 45% compared to May 2017. Westside detached home sales this May were up 35% from April (66 to 89) but down 52% compared to 187 sales in May 2017. This year, sales volumes are off 60% from sales in Feb. 2016 (pre foreign buyer tax). 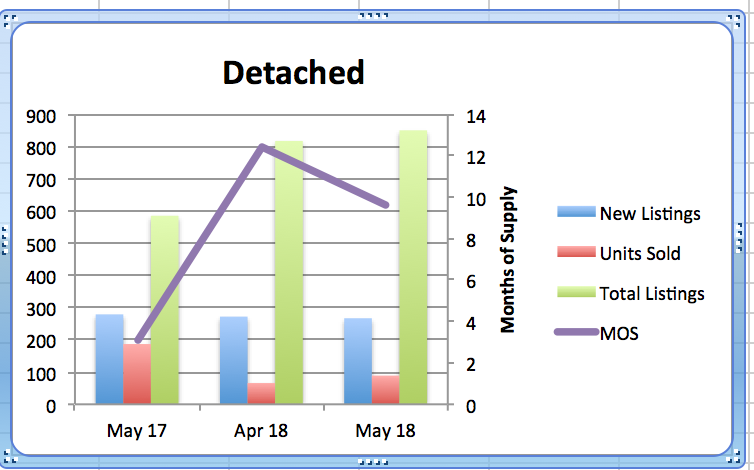 The increase in supply and demand has resulted in adecrease in Months of Supply (MOS) to 9.6, from 12.4 last month but an increase from 3.1 last May 2017. (Usually a balanced market is in the range between 4-5 & 6-7 MOS with prices rising below 4 MOS and falling above 7 MOS). 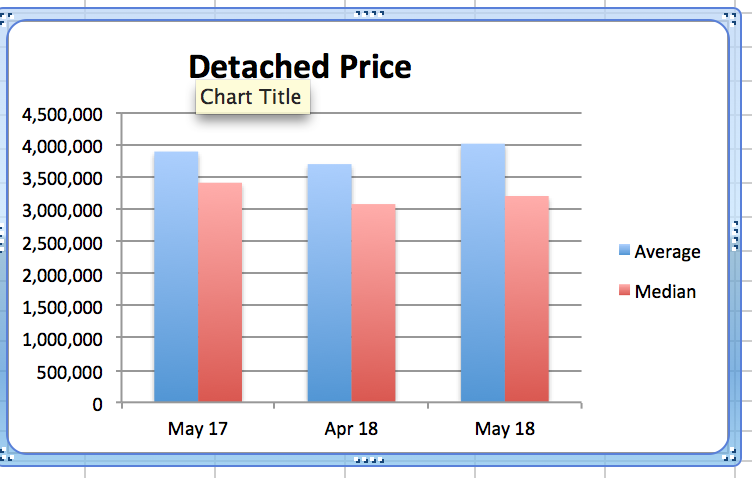 With the the falling MOS this month, detached home prices have increased 8.5% to $4.012M from $3.695M on average and 4% to $3.2M from $3.075M on the median. This is down 10% on average & 17% on median from the highs in 2017. If demand stays low, MOS will stay high and that will continue downward pressure on prices. Typically, the 2ndquarter is the busiest time of the year and that is the case this year. I expect to see similar activity in June but July and August should be slower. The highest sale price for a Westside detached home in May was a whopping $26M. The lowest price was $1.59M. Of those sales, 14 received the asking price or more and 75 sold below the asking price. 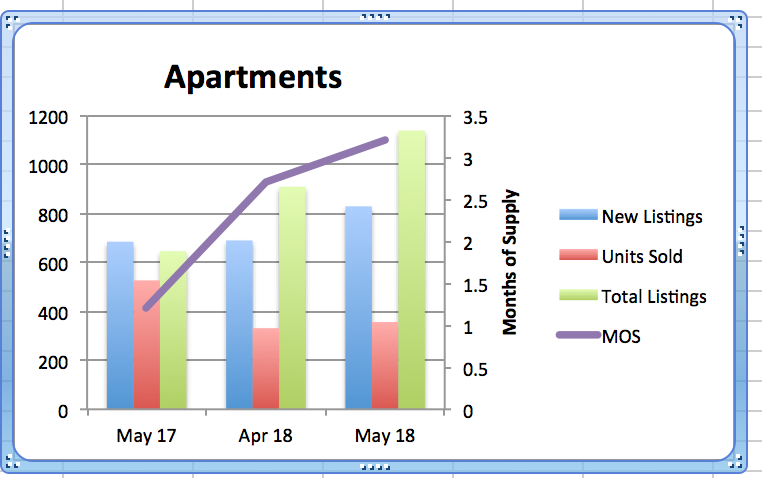 Westside apartment supply increased 25% to 1137 units in May from 908 in Apr. and this is up 80% from the 645 listings we had May 2017. 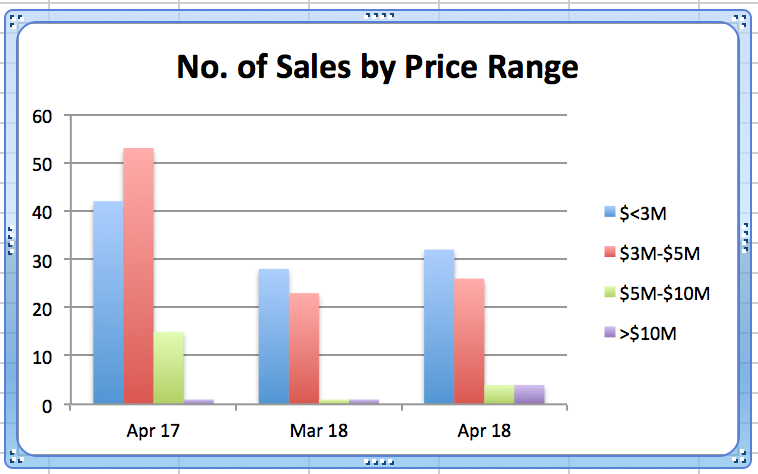 Demand increased 8% to 356 sales in May from 331 in April 2018 but this is down 32% from 526 sales May 2017. MOS in May is 3.2 vs 2.7 in Apr and that is up from 1.2 last May 2017. These levels are low but they are trending up. The average price decreased slightly 7% from $1.086M in Apr. to $1.010M in May and the median decreased 6% $793K from $845K in Apr and increased 4% up from $760K in May 2017. Westside townhouse supply increased 24% this May to 255 homes from 206 in April and up 92% from 133 in May 2017. Demand in May is up 20% to 55 units from 46 in May but this is down 31% from the 80 sales last May 2017. 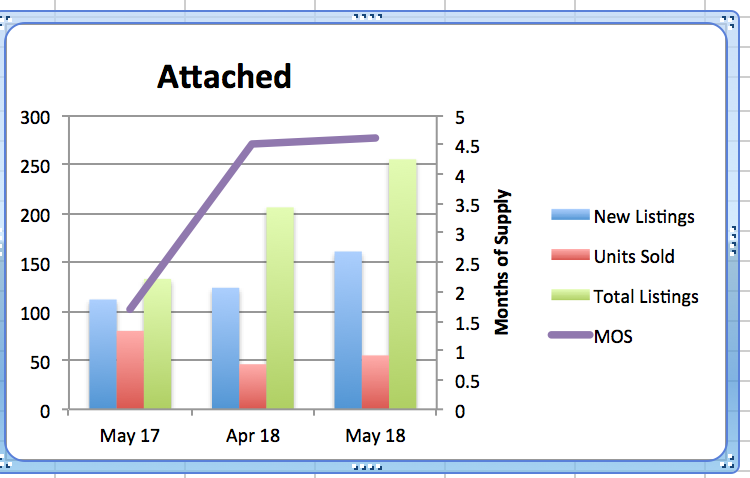 Supply up and demand up equally means the current MOS remained fairly steady at 4.6, up from 4.5 in Apr and up 270% from 1.7 last May 2017. Average prices increased 8% to $1.567M from $1.456M in Apr. and were up 9% from $1.440M last May 2017. Median prices increased 16% to $1.530M in May from $1.135M in April and this was up 5% from May 2017. 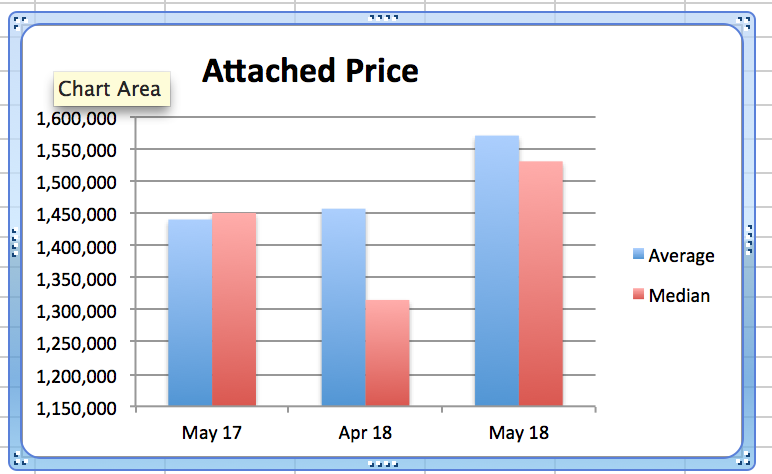 Detached house prices are still low and are creating good buying opportunities. 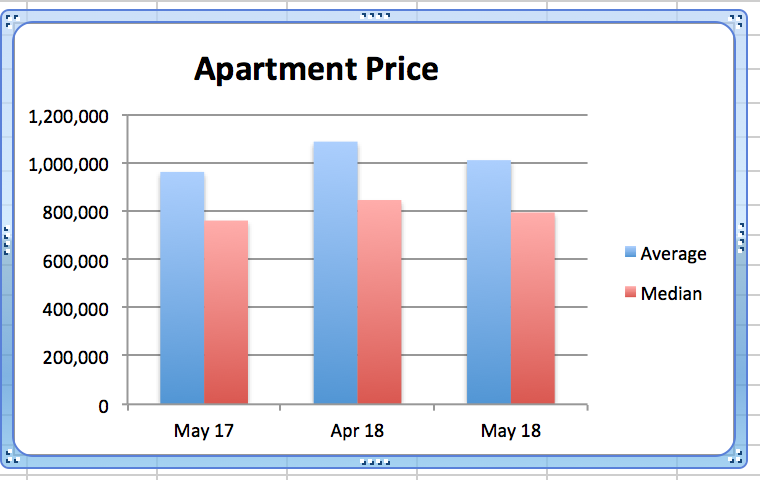 Apartment prices are showing signs of softening and increasing supply may sustain this trend. Townhouse supply is the highest it has been in two years and softening prices bode well for buyers looking to downsize. Real estate in Vancouver is facing challenges on many fronts. Interest rate jumps in the last 8 months totalling 75 basis points have increased mortgage costs by 28%. More stringent qualification requirements (stress test which came in Jan 2018) is causing many mortgages to be turned down and putting the brakes on buying. Government taxation on foreign buyers, local buyers and current homeowners is also cooling demand as everyone stops to assess the effect on their personal financial situation. Vancouver is considered one of the top five cities in the world in which to live. It is surrounded on three sides by water & mountains so real estate is very expensive. San Francisco, Hong Kong, Sydney, New York & London are all expensive cities that make Vancouver look like a bargain. Density will help create more housing in Vancouver but it will never be cheap. Anyone saying they will make housing more affordable will have to destroy many attributes that make the city attractive to deter people from liking Vancouver and moving here. If we have immigration we will increase demand and prices will rise. Supply & demand! A thoughtful consideration of our problems would suggest we recognize the cost of; vacant homes in our community, the lack of transparency in home ownership, supporting families not paying income taxes in Canada, the Colossal Failure of Money Laundering Law Enforcement particularly in BC casinos, the lack of family sized apartments in the city, the use of Real Estate by criminals for parking and laundering profit from illegal activities, allowing equity lending to finance real estate purchases and so on and on. The taxation proposed by the NDP does nothing to address these issues or create affordable housing. It is a wealth tax that punishes all homeowners and savers and it discourages the real estate industry which has been a prime engine of economic development in BC. Please check this link to the BCREA publication on the Economic Fallout of Housing Price Shock (Drops). This Market Intelligence Report, prepared by the economists at BCREA, forecasts the significant negative consequences for BC homeowners and the BC economy from housing price drops. We need to have the NDP reconsider their campaign to diminish real estate and repeal these negative tax grabs.